Near highways A6, A40 and the Loché TGV train station (3 miles away), Hotel Première Classe Mâcon is a 1-star establishment that's ideally located in the artisan district of about 6 miles from the Mâcon city center. 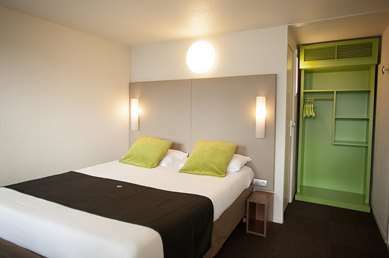 Our budget hotel in Mâcon is a pleasant and easily accessible stop offering 48 renovated, air conditioned rooms, all with en suite bathrooms. An all-you-can-eat breakfast buffet is served daily from 6:30 am to 10:00 am. You will also enjoy private parking, 24 hour reception, free Wi-Fi, and restaurant services just a short walk away. 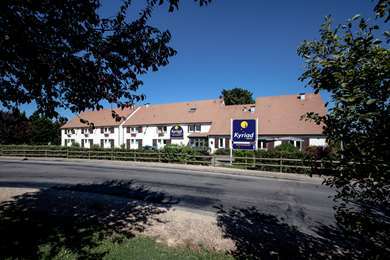 The hotel has 48 rooms to accommodate 1, 2 or 3 guests (double bed, double bed and 1 single, three single beds) and has two rooms specially adapted for people with reduced mobility. Our rooms all have full private bathrooms, a flat-screen TV, air conditioning, a desk, and free Wi-Fi. For only €5, fill up on vitality with the Hotel Première Classe Mâcon Sud breakfast buffet. Breakfast is half price for your children under age 10. I had a hard time deciding if I should write this review or not, but I considered an honest opinion wouldn’t hurt. I chose the hotel based on price and photos, staying before in Ibis Budget I imagined it would be the same but I was very wrong. The doors are old and worned out and difficult to open/close. The entrance is not from inside the hotel but on the outside stairs, so all people staying in rooms on your floor will pass by and see you(also windows are facing that way). The sense of privacy is zero. The smell inside the room is awful, people are smoking in there and it remains impregnated in everything. The smell in the bathroom is even worse, it literally made me wonder if the tub and toilet were washed because it smelled like urine. The faucet had rust and limestone all over, the space between tiles was dirty. Overall I was shocked to see the conditions, I wasn’t expecting such a low class and I will not go there for a second time. The only positive thing I have to say is about the receptionist who was very nice. We are sorry for the problems you mention and we are surprised that you didn't come to tell us about it. We could certainly have found a solution to your concerns. Indeed, access to the room is from outside. This is generally appreciated by our customers because it reduces the noise or the resonance of a corridor for example. About the smell of cigarette, know that all our rooms are non-smoking and we ensure that this decree is respected by everyone. However it is true that some individuals do not respect this law and we are sorry for it. We stayed one evening it was lovely hotel part from pillows. They were really very tin/unsportive . I had next neck ache . My son said the same . Part from that it was nice for budget hotel. It was also close shop and restaurant. Actually we will use next time. We do our best for our customers. About the pillows, we changed all pillows of the hotel for a better stay. We always stop over here on our way to the South of France. Staff are friendly and the breakfasts are a bargain. The room for disabled is very good, ideal for wheelchair users. Personally I would prefer extra pillows but that’s not what everyone wants! All in all a perfect stopover for us. I would certainly recommend this place. It is always a pleasure to see you in our hotel. I closed the door and I forgot my key inside the room by mistake. The reception was closed and nobody ever answered the emergency number displayed. I had to buy a second room from their vending machine and was hoping to at least get a refund. It has been more than two months, they never sent any refund and are ignoring my messages. Moreover, there were ants everywhere in the locked room and they were also in my luggage the following day. I would discourage anyone to ever stay over there! As with all budget chain hotels this is basic but clean and in a good location for a stopover. There is a Buffalo Grill opposite and a Flunch across the road, both basic food chains, but fit for purpose. We actually had the best night's sleep of the week here and would stay again if needing a cheap overnight stop. The lady on reception was very friendly and self check in was easy. Thank you for your comment. We will be pleased to welcome you again.